The work Search by the Japanese artist Jun Kaneko is another significant art project shortly before its completion, whose execution was carried out almost entirely by the DERIX GLASSTUDIOS Taunusstein. This is a glass tower illuminated from the inside, similar to the Lincoln Tower in the eponymous city, which we completed together with Kaneko back in 2014. 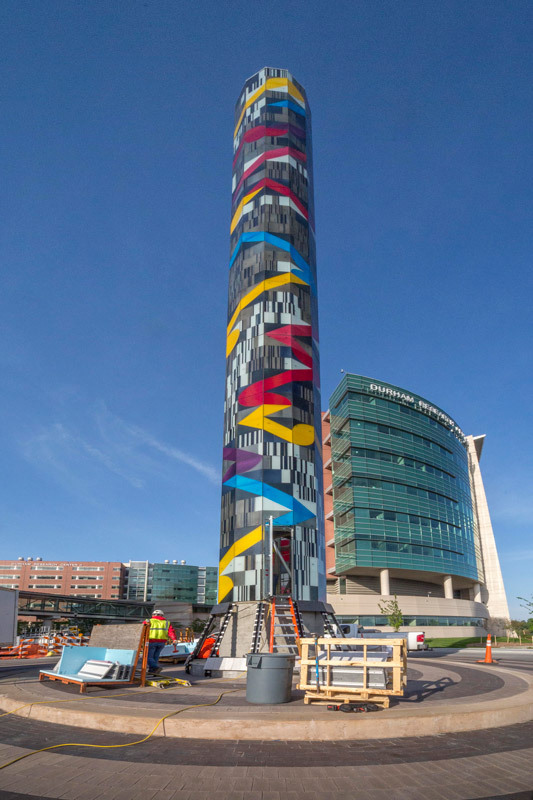 The new tower is under construction in Omaha NE, where the artist lives and will be completed in early May 2017. 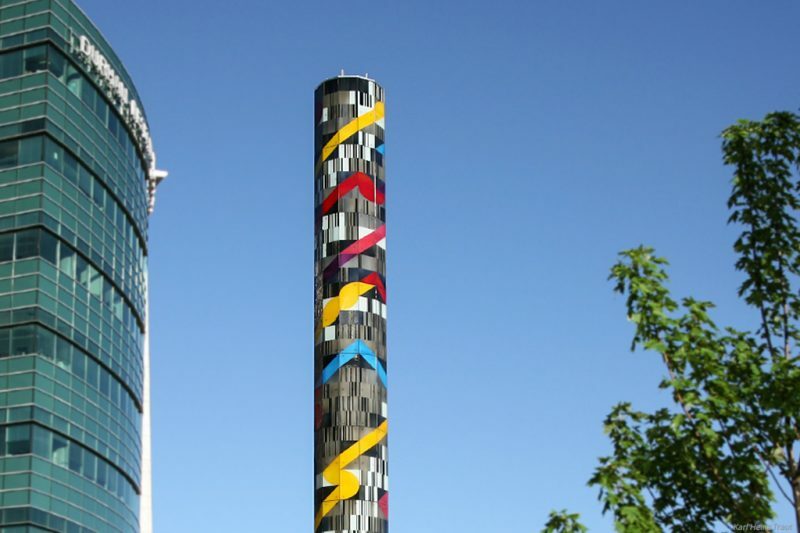 Search is a standalone installation at the centre of a large traffic roundabout in front of the Fred & Pamela Buffet Cancer Centre, a major medical centre specialising in cancer diseases. The 23-metre high construction with its twelve-cornered floor plan is made only of steel and glass. Vertically it is divided into ten floors or glass panels. It rests on a two-metre high base and measures two metres in diameter as well. The surface area of the 120 glass panels is almost 170 square metres. Altogether, more than ten tonnes of glass were used in the construction. Our specialists from the DERIX GLASSTUDIOS Taunusstein were responsible for all the engineering – as in the case of the Lincoln Tower previously. This includes the structural analysis, steel construction, lighting plans and of course the glass artwork. 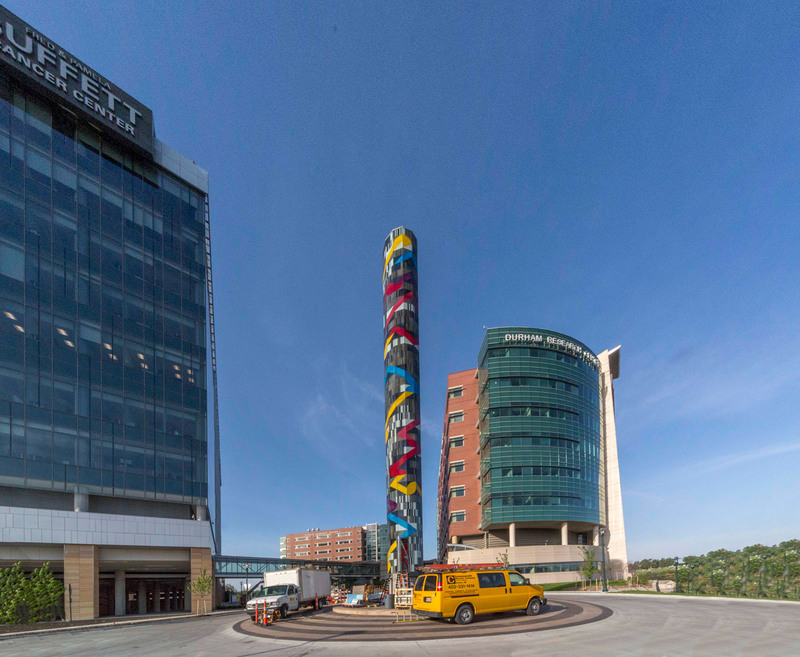 In order to execute Jun Kaneko’s ideas, we bonded mouth-blown and finely cut Lambertsglas® on to an opaque glass substrate (laminated safety glass) and backlit it from the inside with LEDs. To enable the tower to be effectively backlit over its entire surface, we used special LEDs with lenses that ensure the light is scattered precisely. In addition to perfect planning and execution of the steel and glass construction in Germany, Search is also a successful example of the close-knit and effective cooperation with construction companies and local authorities in the United States. Jun Kaneko, born in Nagoya, Japan in1942, has lived in the United States since 1963. He uses numerous techniques and materials for his artistic work, but focuses mainly on ceramics and glass. 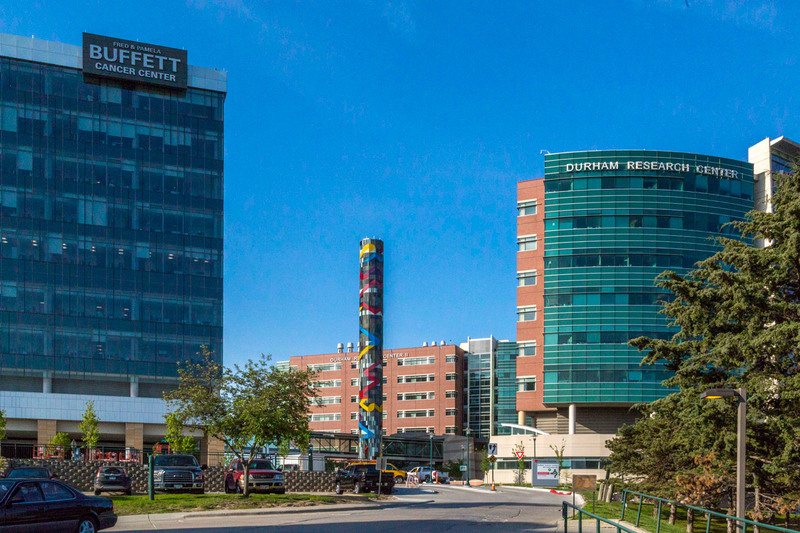 With his Search glass tower, which was funded by anonymous donations, he wishes to create a direct link to the Fred & Pamela Buffet Cancer Centre. 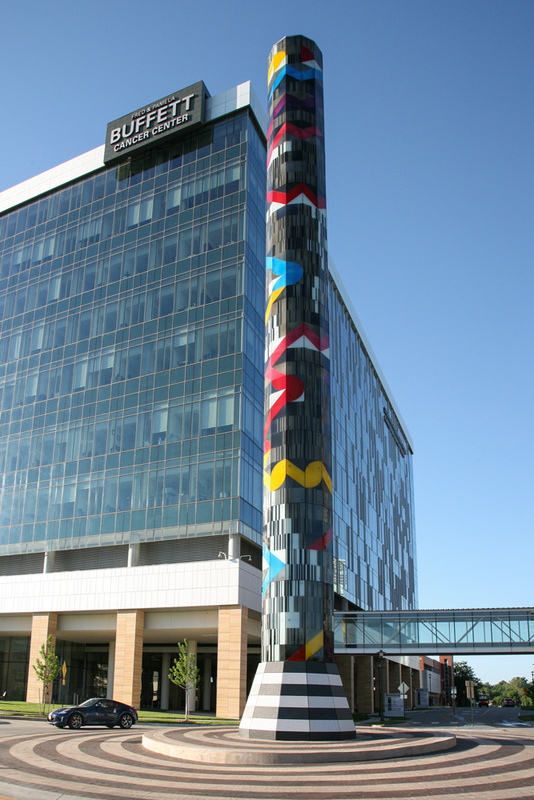 As he says himself, when designing the tower, his aim was to create a positive work of art, which has universal impact on all the people who work at the centre, whether they are doctors, nurses, orderlies or researchers, but also on the patients and their families, who come to the centre for treatment. In addition, Kaneko is particularly pleased that he has been able to erect the glass tower in the city he has lived in for over 30 years.